The CAG tabled two reports in Parliament today. It criticised the Army for letting a private builder usurp prime land in Mumbai by giving it “an irregular no-objection certificate”. “Certain fraudulent activities regarding the piece of land had come to notice. 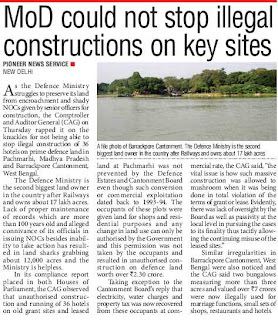 However, the Central Ordnance Depot (COD), Mumbai, did not get the land demarcated in its favour from state authorities,” the CAG said. The 5,166-sq m piece of land usurped by a private builder in Kandivali, Mumbai, had been in the possession of the Army since 1942. 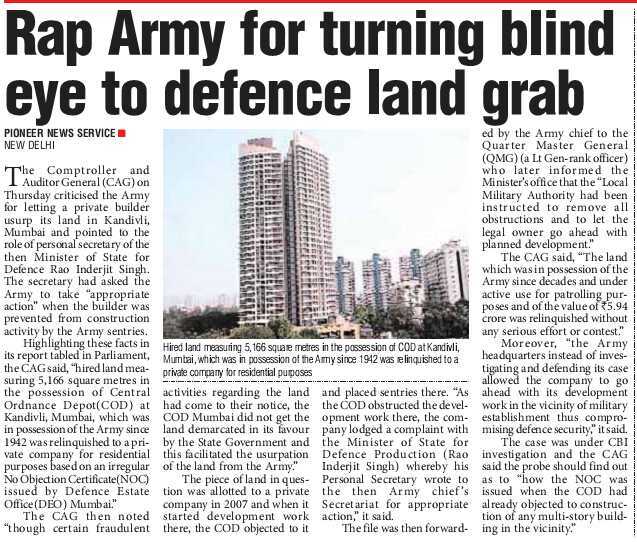 The Army headquarters instead of investigating and defending its case allowed the builder to go ahead with its development work. The CAG has suggested to the CBI, which is already probing the case, to find out as to how the NOC was issued when the COD had objected to the construction of any multi-story building in the vicinity. The CAG has also picked holes in the Defence Ministry policy to promote military industry in the country by questioning waivers given to foreign defence firms for fulfilling their offset requirements. 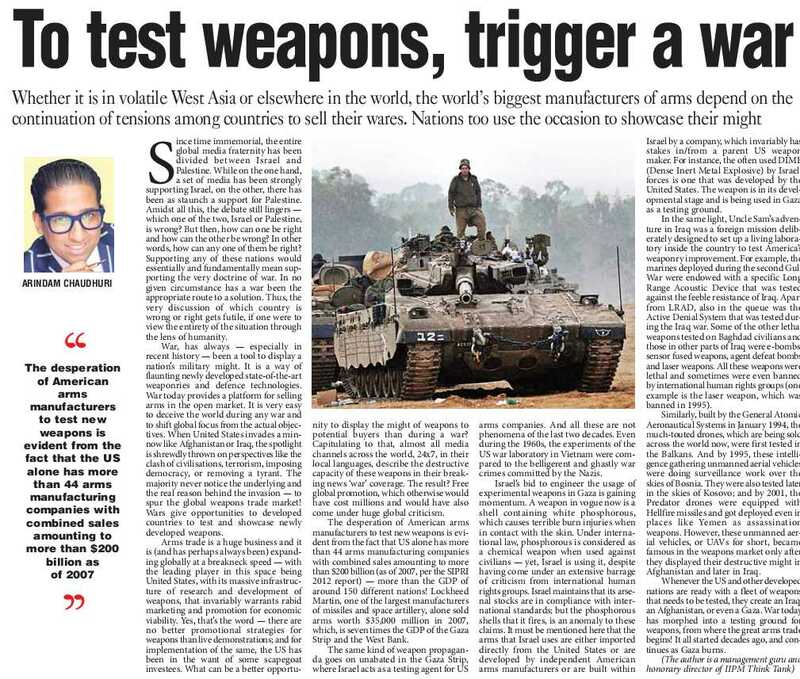 Under the “offsets policy”, foreign vendors bagging deals worth over Rs 300 crore have to invest at least 30 per cent worth of the deal back in Indian defence, homeland security or the civilian aerospace sectors. The monitoring mechanism of the MoD was “ineffective as it was created without a clear definition of its objectives and role. It has remained only a paper exercise”, it said. In some cases, the Indian “offsets partners” were actually 100 per cent owned subsidiaries of the foreign vendor, it said. The CAG said the Boeing proposal to set up a test facility at the DRDO was an investment in kind. “Even as it was not an eligible offset...it was accepted by the Defence Acquisition Council (DAC) and approval in principle for setting up the facility has also been accorded by the CCS,” it said. The DAC had maintained that investment in kind through non-equity route was not permissible for “offset”. The CAG report said a scrutiny of five offset contracts showed that equipment involving Rs 3,410 crore was being directly provided by the foreign vendor in kind without any value addition. The CAG has also pulled up the DRDO. It committed “procedural irregularities” by taking up new projects and splitting sanctions for them to bring it within financial powers of the organisation head. 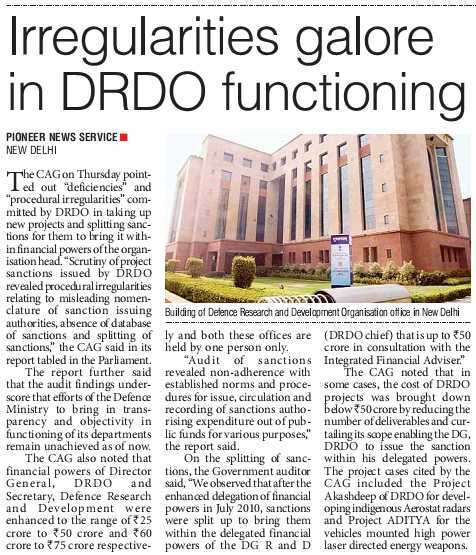 The CAG said the financial powers of the Director General, DRDO, and the Secretary, Defence Research and Development, were enhanced from Rs 25 crore to 50 crore and Rs 60 crore to 75 crore, respectively, and both these offices were held by one person only. 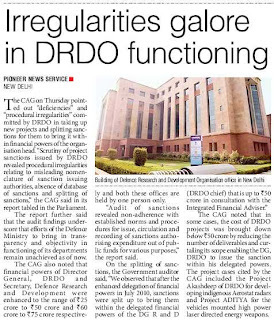 The CAG noted that in some cases, the cost of DRDO projects was brought down below Rs 50 crore by reducing the number of deliverables and curtailing its scope enabling the DG, DRDO, to issue sanction within his delegated powers. The CAG has criticised the Army for letting a private builder usurp its land at a prime location in Mumbai by giving it "an irregular No Objection Certificate" and compromising the defence security. 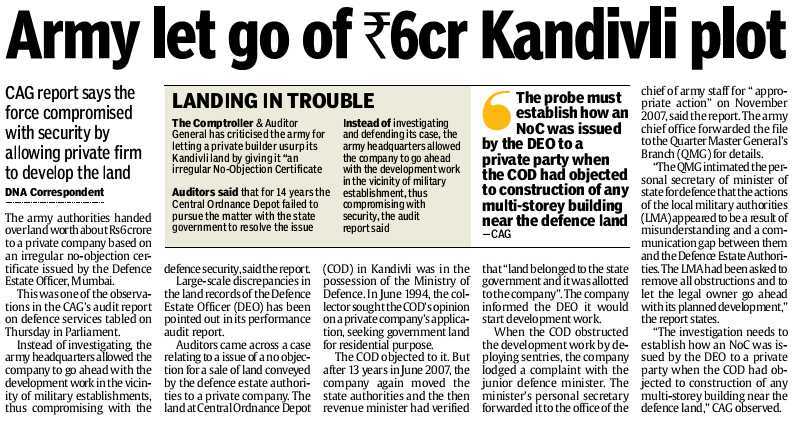 The government auditor pulled up the local defence authorities saying even after "certain fraudulent activities regarding the piece of land had come to their notice, Central Ordnance Depot Mumbai did not get the land demarcated in its favour from state authorities which facilitated the usurpation of the land from the Army." The 5,166 sq metre piece of land usurped by the private builder for residential purposes is in Kandivali in Mumbai and was in possession of the Army since 1942, the report tabled today in Parliament said. The report noted that the said piece of land was allotted to a private company in 2007 and when it started development work there, the COD objected to it and placed sentries there. 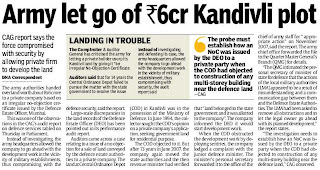 "As the COD obstructed the development work there, the company lodged a complaint with the Minister of State for Defence Production (Rao Inderjit Singh) whereby his Personal Secretary wrote to the then Army Chief's Secretariat for appropriate action," it said. 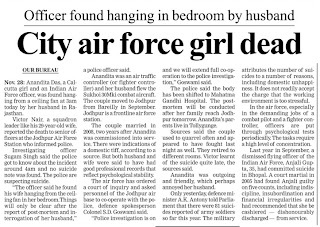 The file was then forwarded by the Army Chief to the Quarter Master General (QMG) (a Lt Gen-rank officer) who later informed the Minister's office that the "Local Military Authority had been instructed to remove all obstructions and to let the legal owner go ahead with planned development." 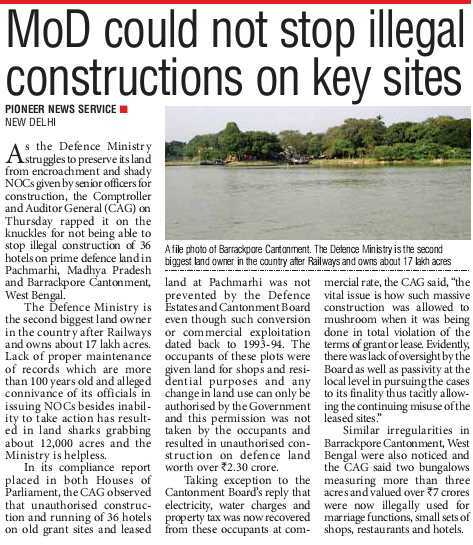 "The land which was in possession of the Army since decades and under active use for patrolling purposes and of the value of Rs 5.94 crore was relinquished without any serious effort or contest," the CAG report said. "The Army headquarters instead of investigating and defending its case allowed the company to go ahead with its development work in the vicinity of military establishment thus compromising defence security," it said. The CAG said the case has been transferred to the CBI for investigation which should try to find out as to "how the NOC was issued when the COD had already objected to construction of any multi-story building in the vicinity." Pune: Chief of Army Staff, General Bikram Singh, on Thursday said that Captain Saurabh Kalia was a very brave officer and the Army had written to the Defence Ministry and the National Human Rights Commission (NHRC) conveying its concern over the brutal treatment accorded to him after capture by the Pakistan Army. "In Kargil war, he made the ultimate sacrifice in the best traditions of the armed forces in the line of duty. 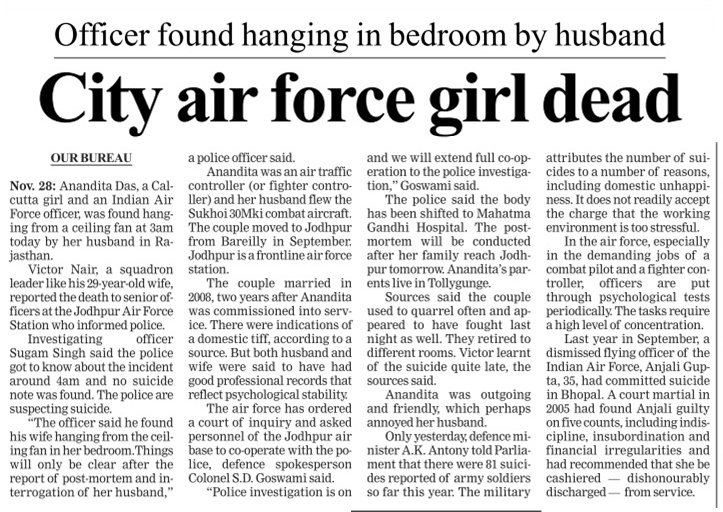 We have written our concerns regarding this case to the Ministry of Defence. We have also written to the National Human Rights Commission. We will fully support the parents of Captain Kalia," he told mediapersons on the sidelines of the 123rd passing-out parade of the National Defence Academy (NDA) at Khadakwasla in Pune. 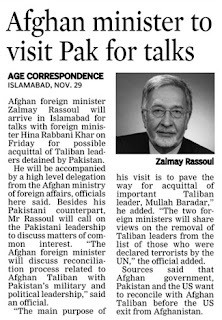 External Affairs Minister Salman Khurshid earlier today said Pakistan should take responsibility if somebody from its side is responsible for the untoward happening. "This was treated as a very seriously bilateral matter and will be continued to be treated in the very same bilateral matter. The issue is not so much as to who may have done it, but certainty the issue is that someone from the Pakistani side is responsible; and if someone from the Pakistani side is responsible then Pakistan must take responsibility for it," Khurshid told mediapersons in New Delhi. Dr NK Kalia, the father of Captain Kalia, has moved the Supreme Court seeking directions to Union Government to take up his son's case at the international judicial forum. Captain Kalia was captured and subjected to brutal torture by the Pakistan Army in 1999. Dr NK Kalia, a retired scientist, has in his petition to the apex court contended that the Ministry of External Affairs (MEA) and the Ministry of Home Affairs (MHA) should ask International Court of Justice (ICJ) to expose the ''torture'' that resulted in the death of Captain Kalia and his fellow soldiers. 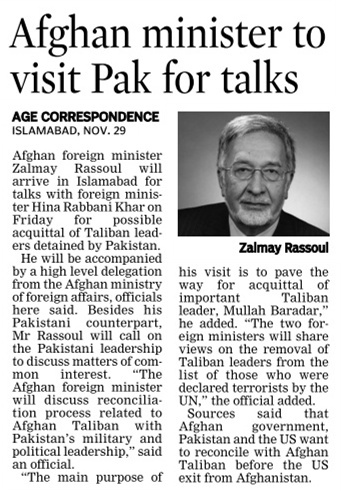 He has also asked the Indian Government to get Pakistan to apologise for the incident that went against all norms of the Geneva Convention related to incidents of war and capture of military personnel. Dr NK Kalia, who has been shuttling from Ministry of Defence (MoD) to Army headquarters and the Ministry of External Affairs, and to the Prime Minister's Office (PMO) in the past 13 years, wants the Indian Government to exert pressure on Pakistan to identify and punish those Pakistani soldiers who indulged in the barbaric torture of his son Captain Kalia. Dr Kalia has argued that the attitude of the Indian Government in not responding to various representations made by him for appropriate action against the Pakistan Government at the international forum, has forced him to approach the Supreme Court to bring justice to the Indian soldiers who were subject to war crimes by Pakistan. Immediately after getting commissioned into the 4-Jat Regiment of the Indian Army, Captain Saurabh Kalia was posted in the Kargil area. In May 1999, Captain Kalia had gone out for patrol duty in Kaksar area of Kargil along with five other soldiers - Sepoys Arjunram Baswana, Mula Ram Bidiasar, Naresh Singh Sinsinwar, Bhanwar Lal Bagaria and Bhika Ram Mudh. They were caught by the Pakistan Army, which kept them in captivity for over 22 days and subjected to brutal torture as evident from their bodies handed over by the Pakistan Army on June 09, 1999. Parts of their body were burnt with cigarettes, eyes were gouged out before puncturing, teeth and bones were broken and various limbs and private organs of these soldiers were chopped off. Stephen Cohen in his book, ‘The Indian Army’ states that “De Tocqueville and other theorists argued that democracy and a large standing army were incompatible, but India has managed both.” This act of ‘management’ has not been easy as the civil-military relations in India have been scarred by several strains and stresses. While the British colonists looked up to the Indian army as “an oasis in desert of chaos,” to the Congress guru Gandhi, it was merely a tool of colonial coercion and thus an object of “people’s hatred” as it had been “employed in indiscriminate firing” on the masses. To ride this ‘tiger’, one can discern a three-pronged Nehruvian strategy with regard to the Indian army. The first was to keep its budget low in the name of economy; exhibit a gesture of peace towards the neighboring countries; and to maintain a military that was more compact and mobile rather than inflated in numbers. In December 1950, he went public by stating that he preferred a highly mechanised but small army and also decided to reduce its size for reasons of economy. Despite these pronouncements, when the first Indian Army Chief K M Carippa approached Nehru in 1951 for more defence outlay to strengthen the north-eastern frontier against China, he was nonchalantly told, “You mind only Kashmir and Pakistan” – a decision that Nehru was to regret after his defeat at the hands of the Chinese in the 1962 war. The second aspect of his strategy was devised in consultation with his Home Minister Sardar Patel whereby as a counterpoise to the army, both planned to increase the strength of the paramilitary forces. The third aspect of the civil-military relations that really irked the latter was postulated by Nehru through his confidante and Defence Minister V K Krishna Menon, who is on the record to have said, “It is wrong for the army to try to make policy, their business is to be concerned with military tactics…. 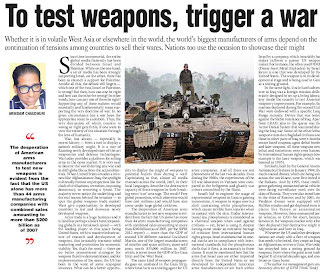 The government is not going to say that it wants one company here and two companies there, but the government will certainly say, ‘We should attack Pakistan’ or ‘we should not attack Pakistan’.” Ironically, both of them did not adhere to this self-professed principle because Lt Gen S L Menezes (retd), who served the Indian army for over thirty-seven years, has revealed in his history of ‘The Indian Army’ that both Nehru and Menon constantly interfered in the army operations during the 1962 Sino-Indian war “before the operations as to the deployment even of companies and platoons.” With an unsparing stick to beat Menon, Menezes ruefully adds that conflict was the leitmotif of Menon’s life as he often threatened court-martial to even those officers who dared to ask genuine questions in the defence briefings. No wonder, he was the most hated defence minister of India as two instances clearly indicate. One, some anonymous army officers wrote a letter to Nehru in 1961 alleging that “the Defence Minister… seems to wield some black magic… over the Prime Minister.” Two, the more outlandish step stated by W Hangen, the author of ‘After Nehru, who?’ in which he claimed that “Indian officers actually approached a Western attaché in New Delhi for help in arranging to have Menon assassinated.” The top brass also resented Menon’s interference in promotions so much so that the Army Chief General K S Thimayya resigned in protest in 1950 but retracted on Nehru’s request. The next question that begs an answer is to what extent was the character of the independent Indian democratic state as envisioned by Nehru was to be any different from the oppressive colonial state? Not much really as is evident from a recorded conversation between the last Viceroy Mountbatten and Nehru in March 1947, on the eve of partition: ‘I asked Nehru if he agreed that the army was the final guarantor of law and order…. He agreed.” Even Gandhi’s desire of turning the coercive nature of army into a constructive force that “must plough the land, dig wells, clean latrines, and do every other constructive work” has remained an elusive dream. Whether the Indians accept or not, the fact is that the army remains the ultimate guardian of the Indian democracy.